I had so much fun at the cooking class last week. I am keeping my fingers crossed that I can do more of it. Work has been stressful. 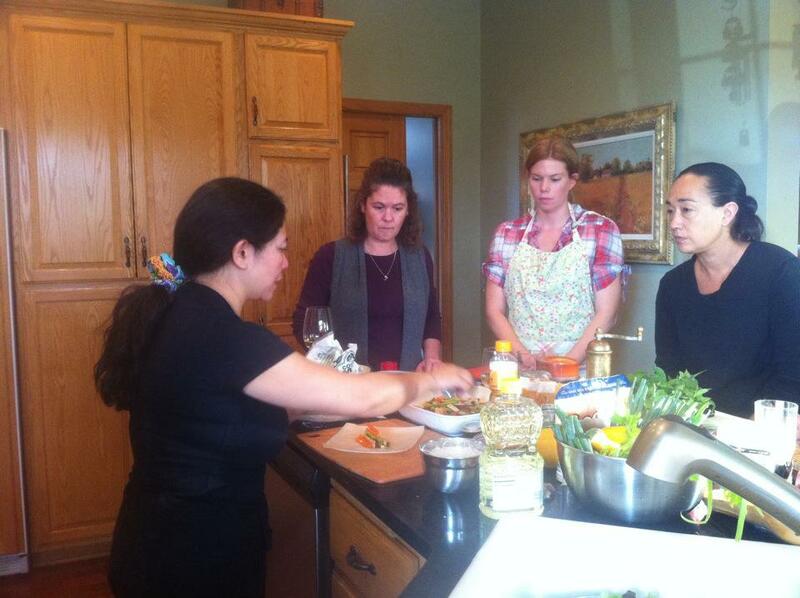 I felt so light and alive when I am cooking with a group with wonderful people. I am pretty sure they have as much fun as I did. 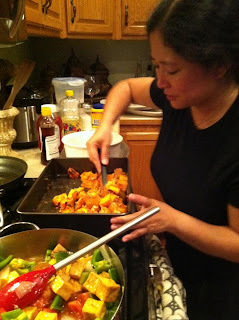 More and more I want to share my cooking with others, I am considering doing some weekly meal preparations or even some in home dinner parties for another one. Especially with the holiday, I know I can help. 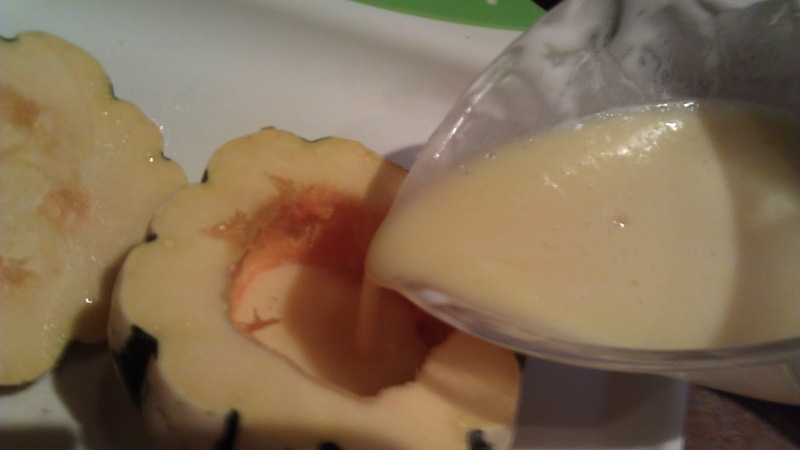 While I was packing up to leave, one of the ladies asked me for a fall dessert idea. She wanted something simple, easy to make, but with the look of the season. I immediately thought of the basket of squash I had at home from the CSA and those the dumpling squash. They have a very simple taste, a little sweetness and very versatile. Best of all they are cute! Here is an idea that I suggested to here.The inspiration came from the simple dessert that my Thai auntie used to make : Thai custard in a pumpkin. 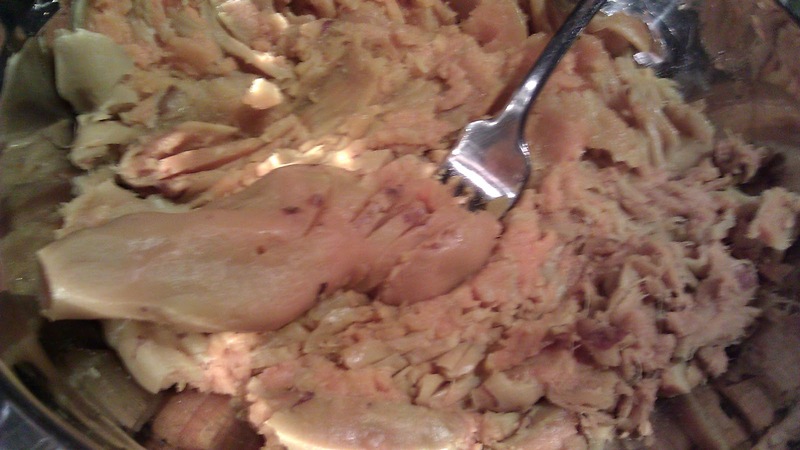 In the tradition recipe, the pumpkin is cut into wedges and served. I don’t think it has a “Wow” table appeal. I want to keep cuteness.. Plus she is bringing a dessert for a couples dinner. What’s more sensual than letting each couple share the dessert…. 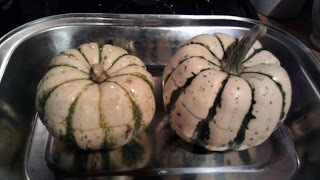 2 small dumpling squash with stem, try to get them about the same size. 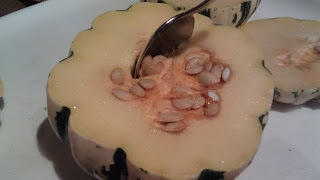 Wash the squash and cut a “cap” off the top of the squash. Remove the seed and pulp. Make sure you take off the little bit of seeds and pump off the cap too. Set a side. 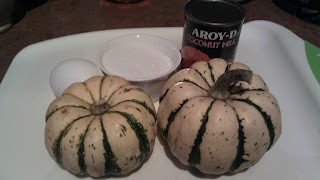 Put the cap back onto each of the squash. 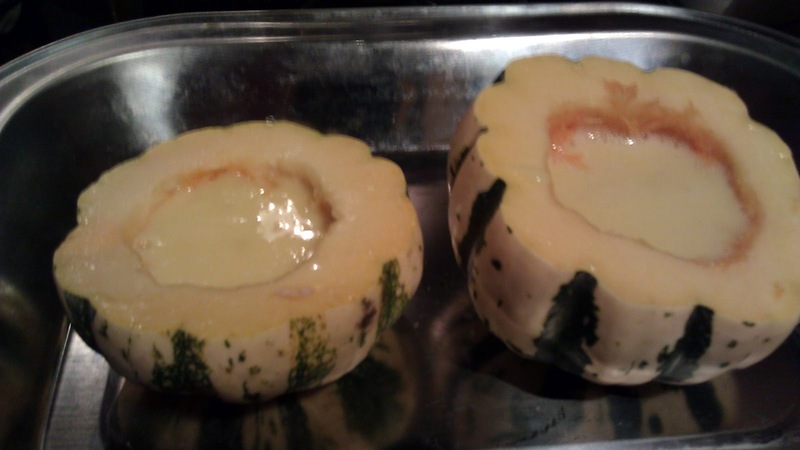 Bake for 30 min. 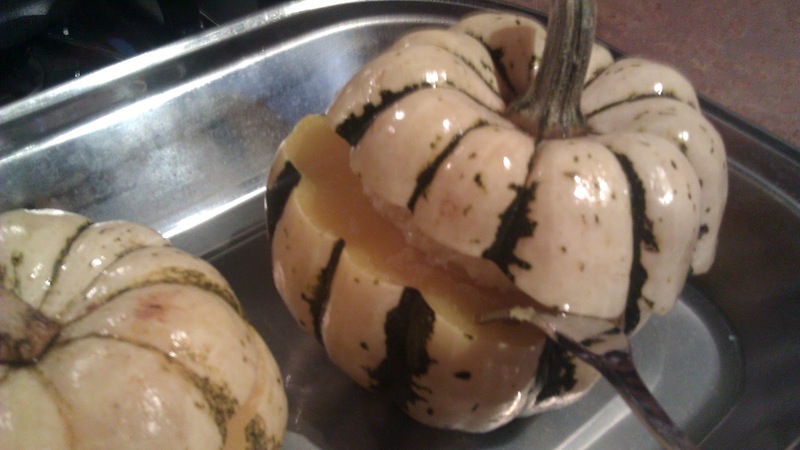 Check for doneness by inserting a small fork or toothpick in the “meat” part of the squash. When it is tender, it is ready. Transfer each of the squash on a individual serving plate. 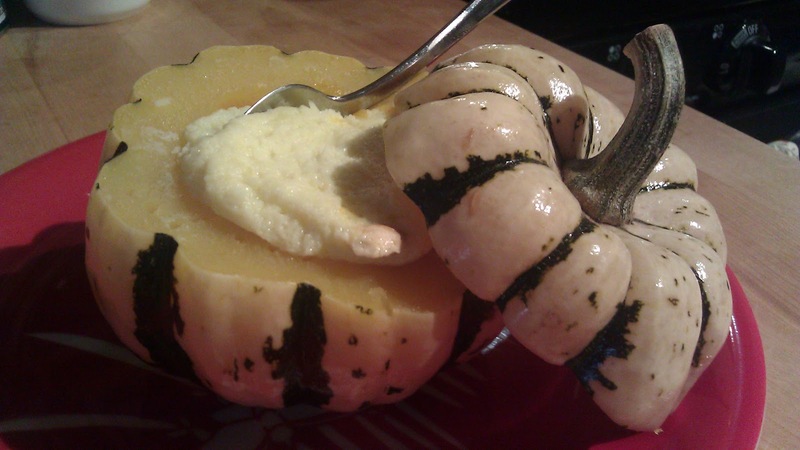 Note: my custard is a bit overcooked today since I have 2 different size of squash. Mahalo for coming to the class!!! We had a great time cooking together. I was too busy cooking and didn't get to take some picture. Here is a couple from one of the group. Banh Trang Spring roll wrapper. Indonesian Palm sugar (gula jawa). Wen Chuan Spring roll Shells. From Hilo Coffee Mill and a big thank you for the coupons. Palm Island Premium black lava salt. 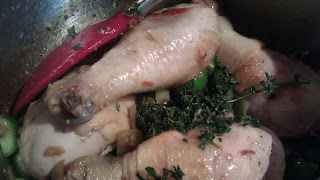 I have a private cooking class this weekend... want to know what we are making? It is a vegan and wheat-free meal (almost all wheat free). I have to make adjustment for a lady in the class. - Fried classic Chinese spring roll with celery, carrot and 5-spice pressed tofu filing. 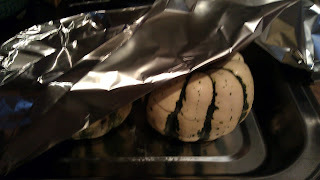 We will be using both traditional Chinese wrapping and a wheat-free Vietnamese rice wrapping. - Vegan version of Laotian "meat" salad, using soy crumbles,seasoned with blue ginger, lemongrass and lime juice Tossed with Thai basil, mint, kaffir lime leaves, cilantro. Served over shredded lettuce. 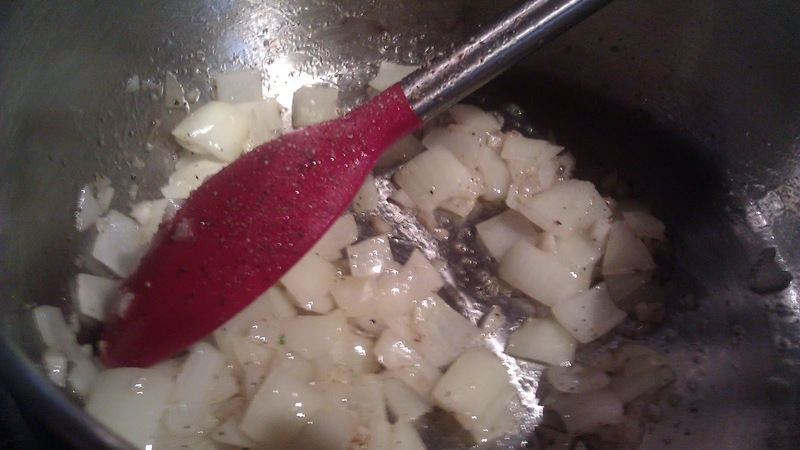 Top with Fried onion for crunch. - My mother's "secret" sweet sour sauce with stir-fried sweet peppers and tomatoes over fried tofu. - Counter balance the sweet sour with some saltiness from a simple miso glazed squash roasted in the oven. 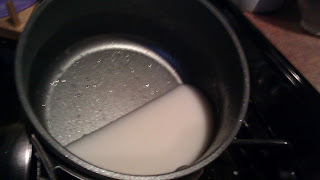 - simple mix of 1/2 brown and 1/2 white rice commonly served in Hawaii. 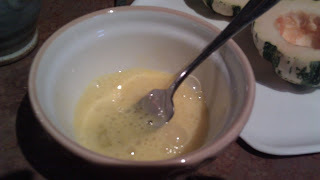 - Jasmin rice pudding cooked with coconut milk, served with mango and a dash of volcanic black lava salt. And... no meal is complete without Ka'u coffee and Mamaki ginger tea from Hilo Coffee Mill. 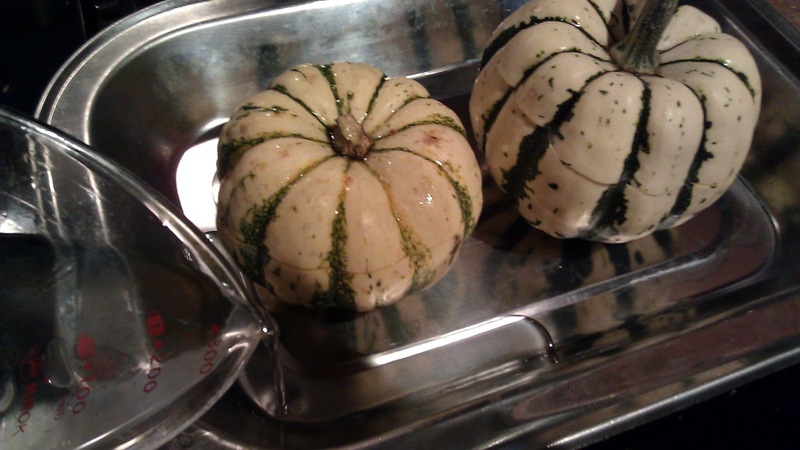 The menu is designed to use locally available seasonal produce. 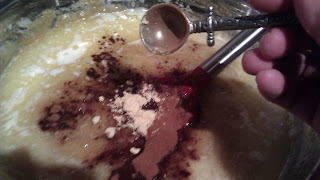 The recipes are modified to fit our life style in Minneapolis. 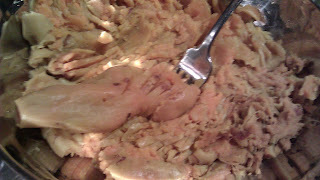 Put oon my cowboy boots, make a Sweet Potato pie for my 2-step man!!! My CSA is coming to an end soon. I am going to miss the weekly supply of wonderful fresh vegetable. I will also miss the "surprise" challenge each week. 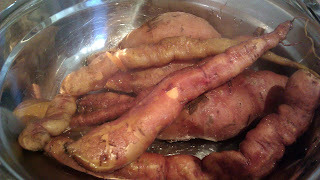 This week CSA came with a pile of sweet potatoes. They are all in some funny shape. 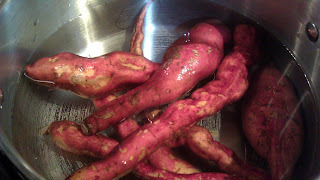 I was told that our fall has been very dry and the soil was hard, the sweet potatoes were trying so hard in the ground and they ended up in some elongated knotty shape. They are still sweet and wonderful. I wanted to do something with them apart from roasting. I then remembered how much I loved sweet potato pie when I lived in the south. I found a recipe online, as usual, I "Kulia-fied) it. I am making a pie for Mr Wonderful. I came to the conclusion that Mr Wonderful is a "closet" pie-lover. He said he did not care for dessert or sweet, but he would always find room for pie. He would have a slice of pie for breakfast! He told me he knew pies, his mother and sisters were all bakers. They used to make some amazing pies. However, they have never make sweet potato pie. 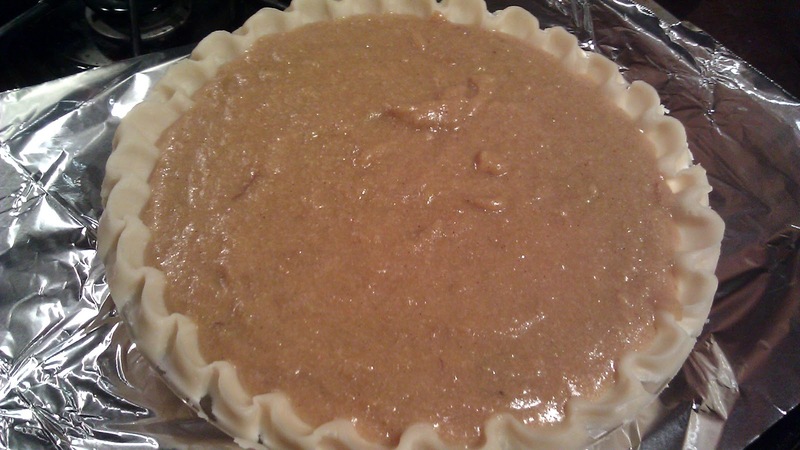 This will be a nice surprise for him - some sweeet po-ta-to pie for my hon-ky-tonk man! (You have sing this like a country song). 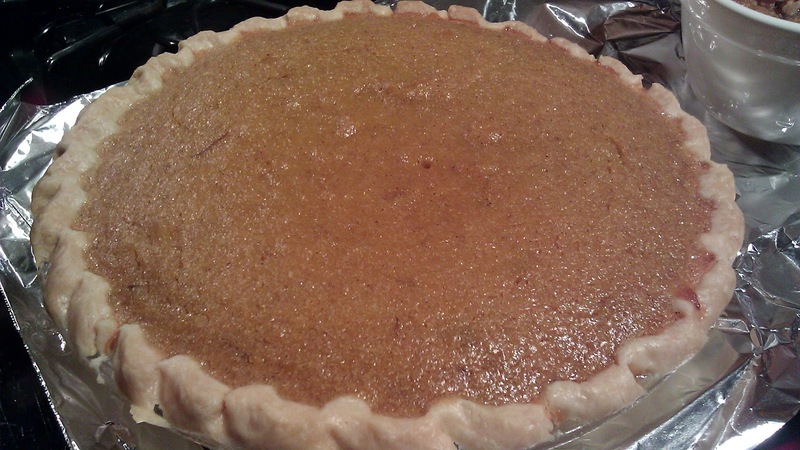 Classic Southern Sweet Potato Pie. 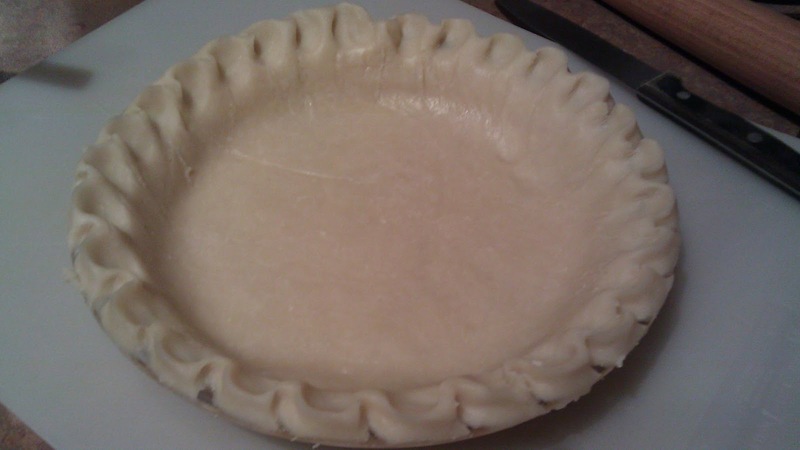 Line a 9" pie pan with the crust. 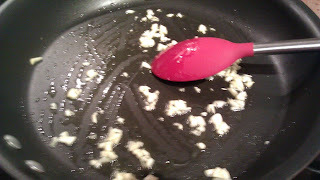 Crimp the edges or you can just press down the edge with a fork to create a pattern. 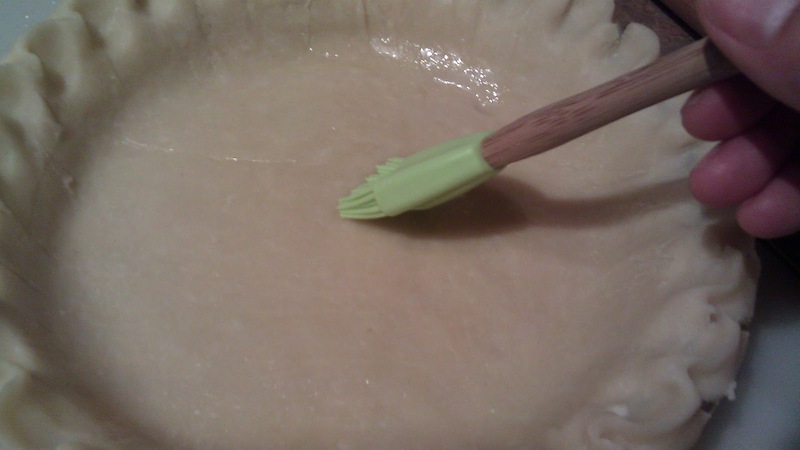 Brush the pie crust with a bit of the white. 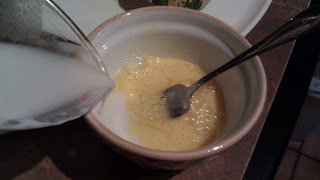 I call this "waterproofing" to prevent the crust from getting too soggy from the custard. In a med bowl, mash the sweet potatoes. 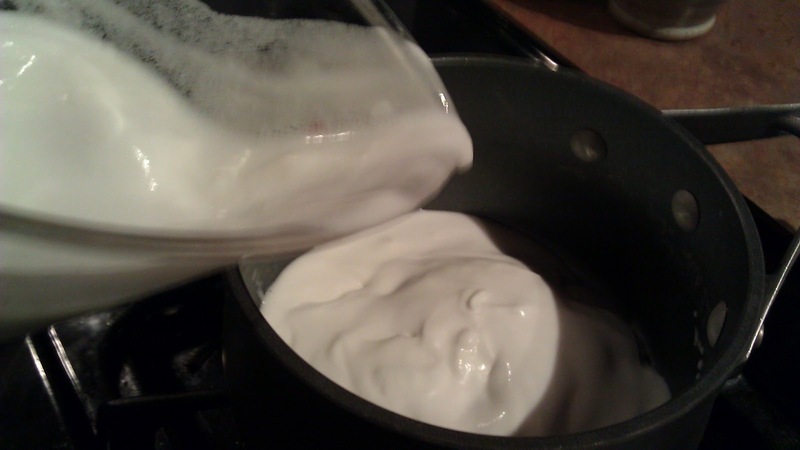 Make about 2 cups. 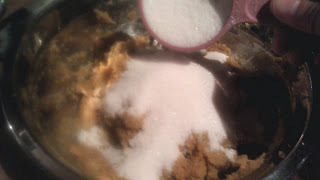 Add 1/2 cup sugar, mix well. 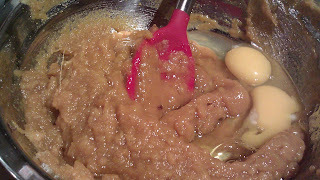 Add cinnamon, ginger, clove and vanilla. 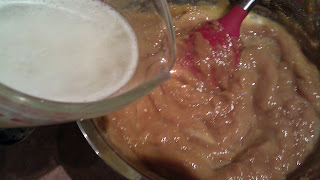 Whisk the mixture together till blended. Place the pie on a baking sheet and bake for 60 mins. 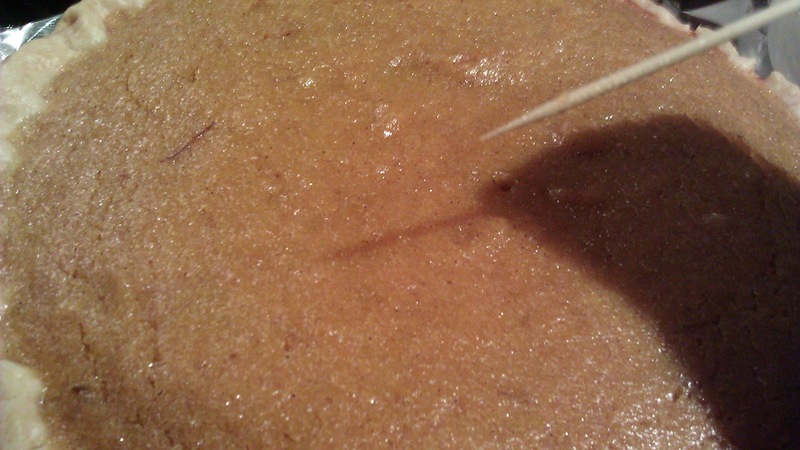 Pie is ready when you insert a toothpick in the center and it come out clean. 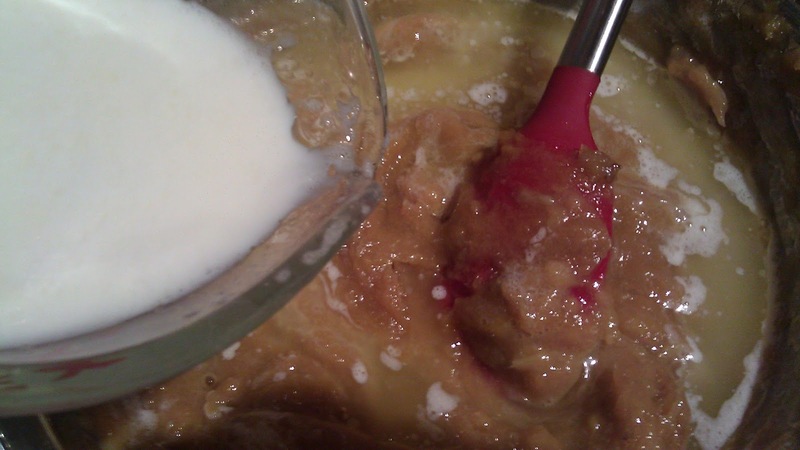 fold in 2 tbsp of maple syrup. Continue whipping the cream till set. Leave in the fridge for 30min. I love tomatillo and I was thrill to have some from the CSA. 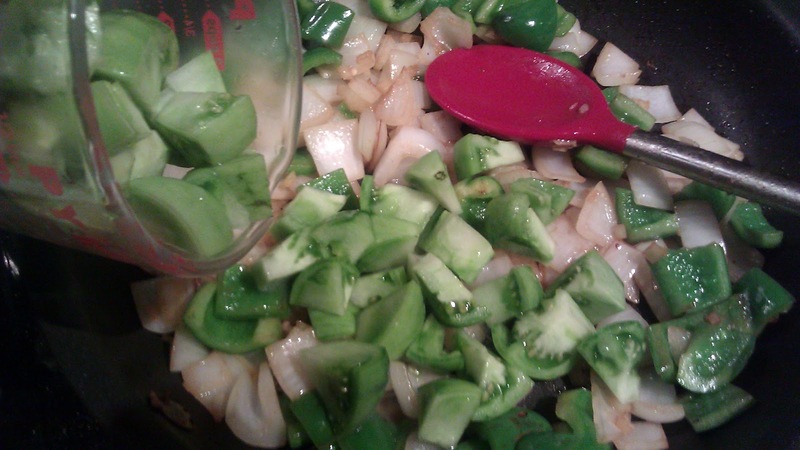 I was going to make some salsa. Somehow it does not feel right to be making something cold. It seems so natural to have something comforting when there is a chill in the air. 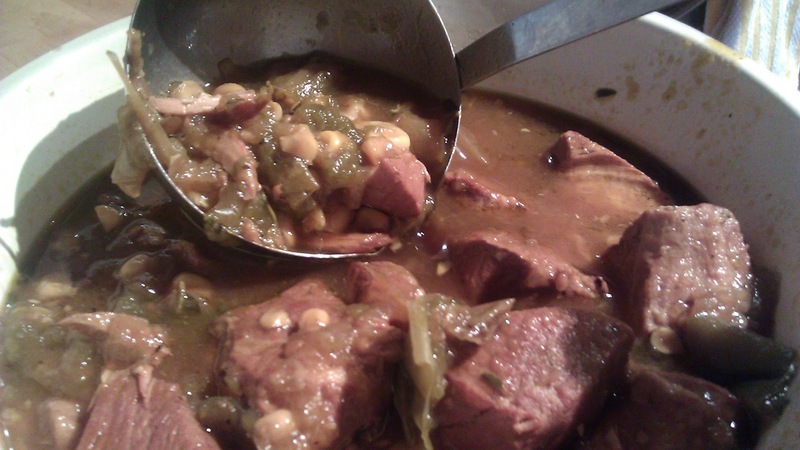 Here is another stew with some Mexican influence. 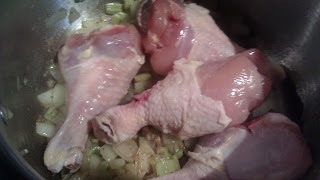 I prefer to use legs and thighs with bone in a stew. 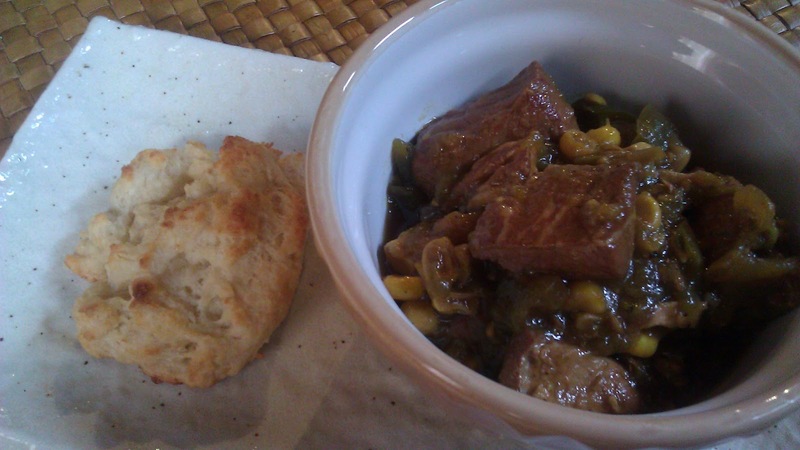 I found that those parts made the stew more flavorful and the meat tends to be less dry. 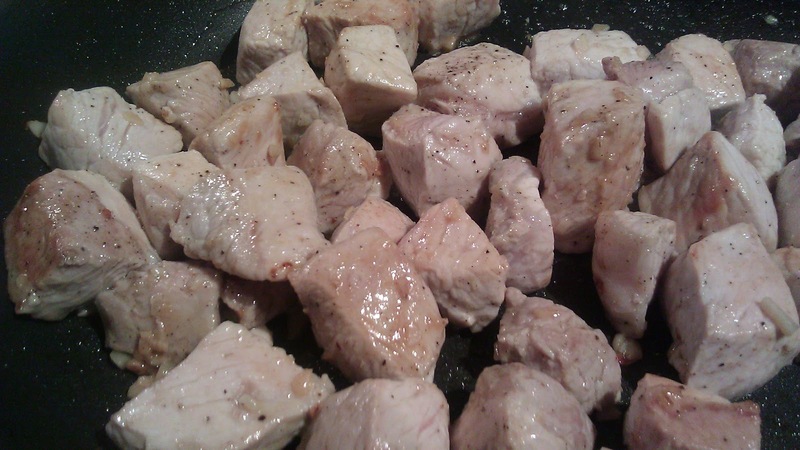 However you can always change the meat selection in this recipe to 2 chicken breasts. 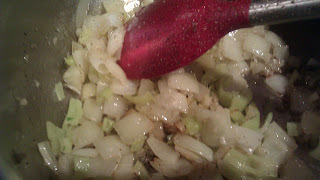 1 onion, cut into 1/2" pieces. 2 hot peppers, vein and seeds removed, finely chopped. I am using Aji crystal pepper. 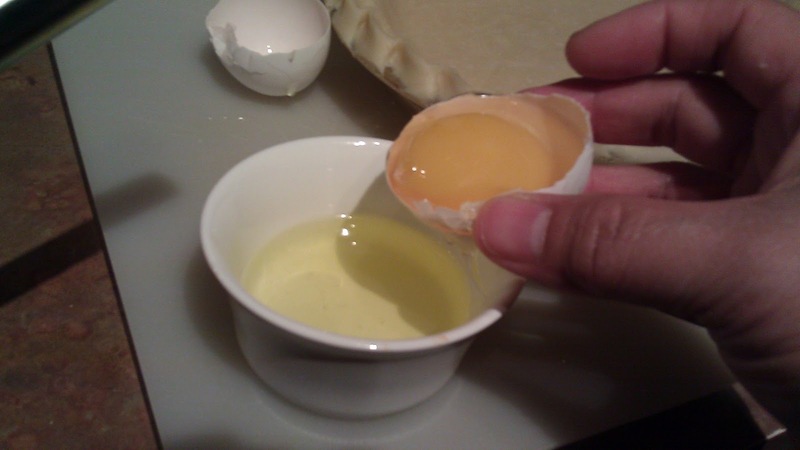 1/4 cup lime juice. (Juice of a lime). 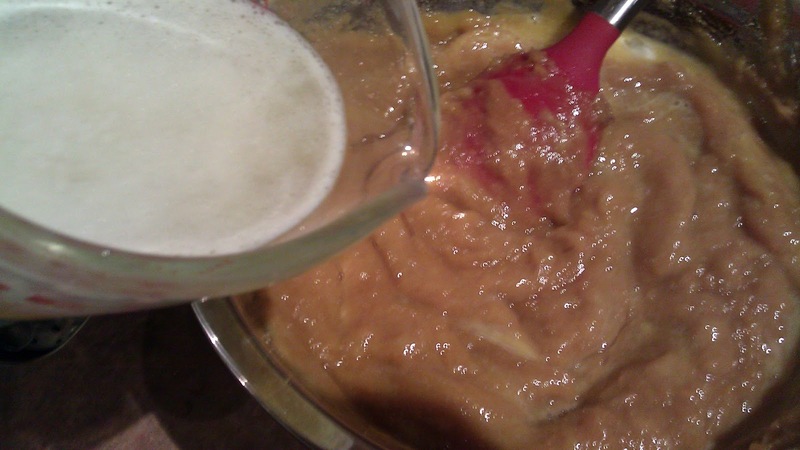 I am using 3 key lime to make up the amount of juice. Add the chicken pieces and let it brown. When the chicken pieces are browned. 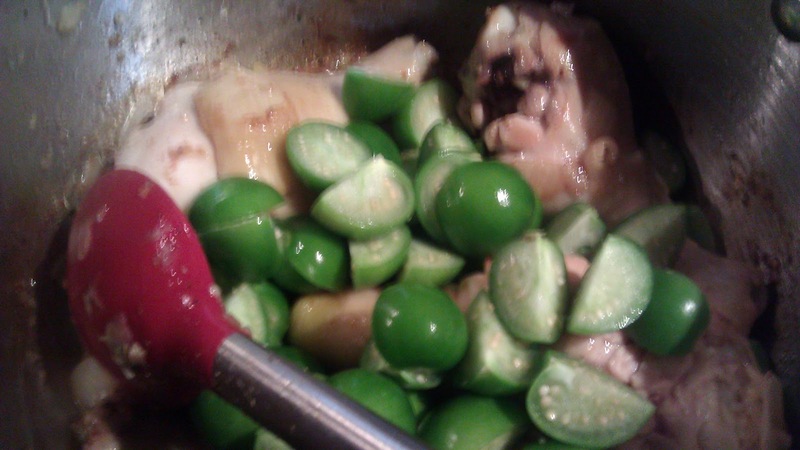 Add lime juice. 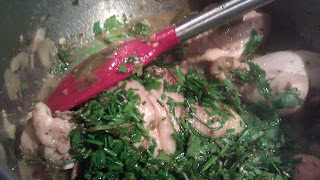 Add 1/2 of the chopped cilantro and 1/2 of the chopped chives. Finally a cup of water. 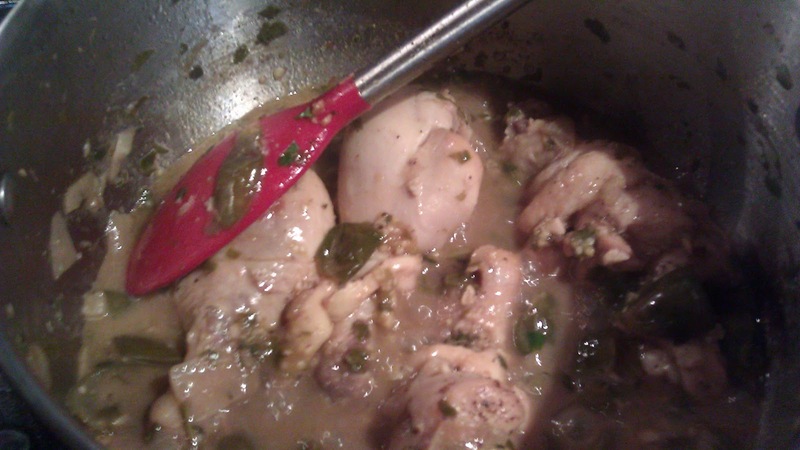 When the chicken pieces are cooked, vegetable softened and the sauce thickened. Correct the seasoning with salt and pepper. 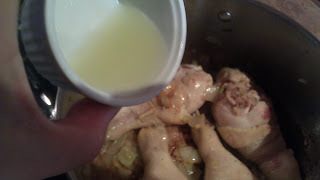 Depending on the cookware and the stove, if the sauce is too runny, you can let it boil and reduce the sauce a bit. Finally, fold in the remaining chopped cilantro and chives. 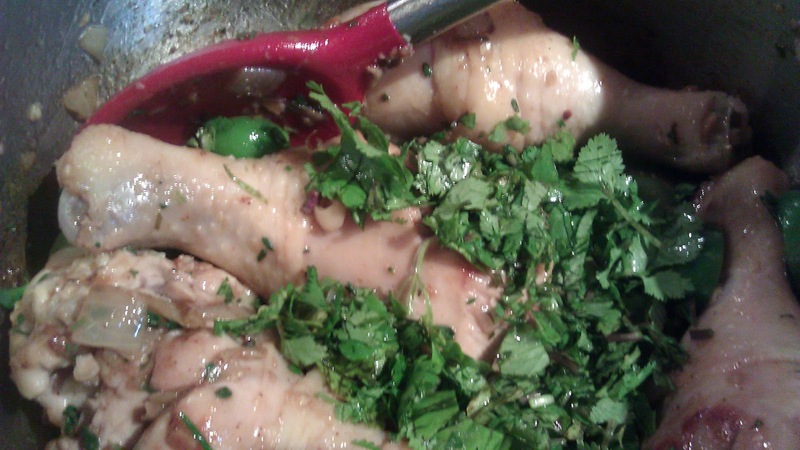 Transfer to a casserole dish and serve family style with rice. 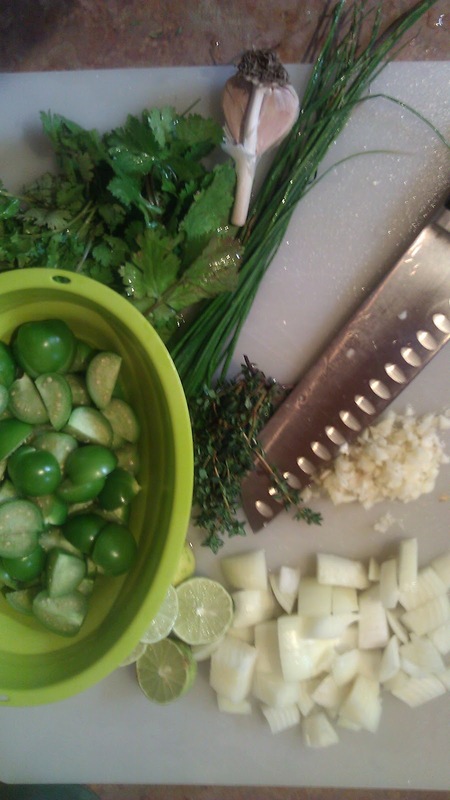 Garnish with a few sprig of cilantro and lime slices. 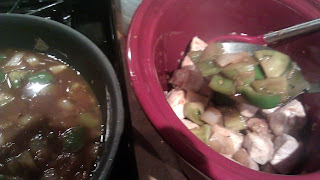 or you can plate it with 2 piece of chicken for each person, spoon some sauce over the meat. Garnish. We love it with a simple field green salad on the side to balance some of the heat. It has some heat, but not over powering at all. 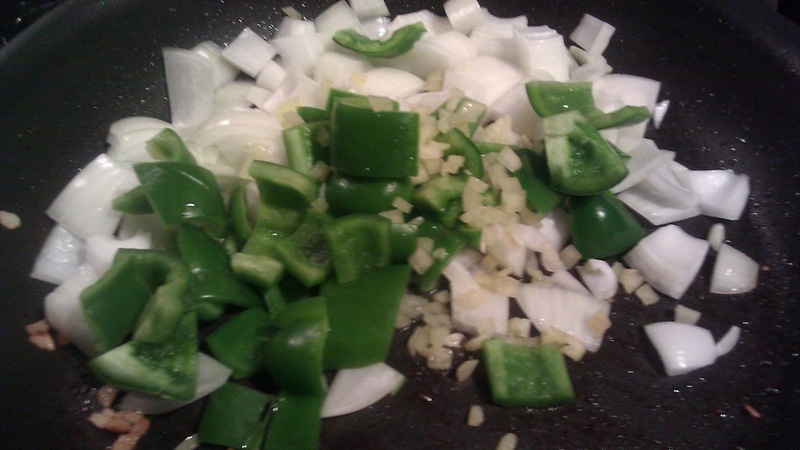 You can skip the hot pepper if you prefer a milder taste. Serve 2. can be easily doubled. Mr Wonderful is really into stew these days. His favorite is a simple German boiled dinner. 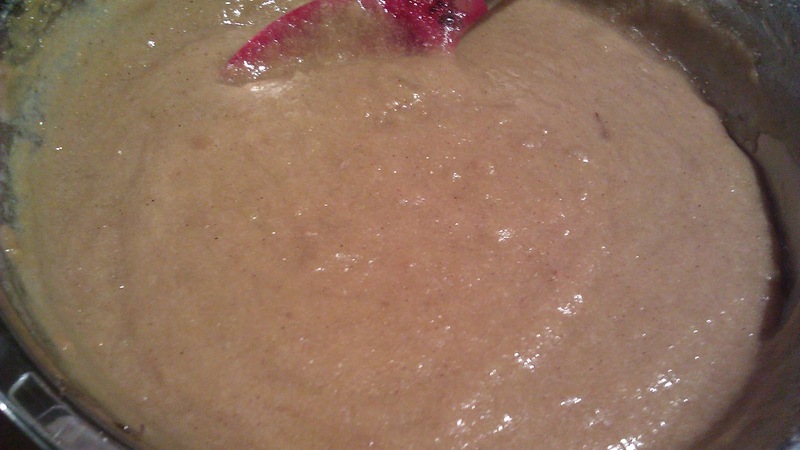 It is basically putting a bunch of root vegetables, a cabbage and some kind of cured meat such as sausage or ham boil down into a soup. I think I need to give him a little variety. 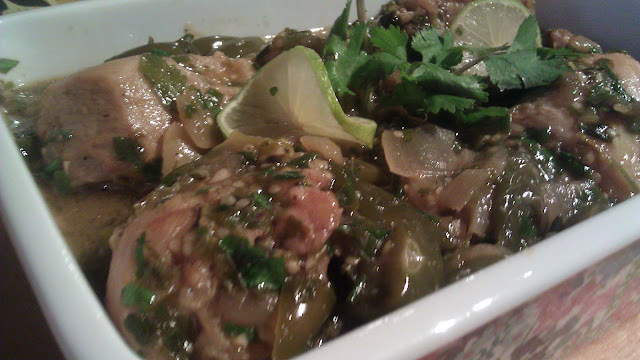 This is a recipe modified from a Chile Verde (Pork and Tomatillo stew). 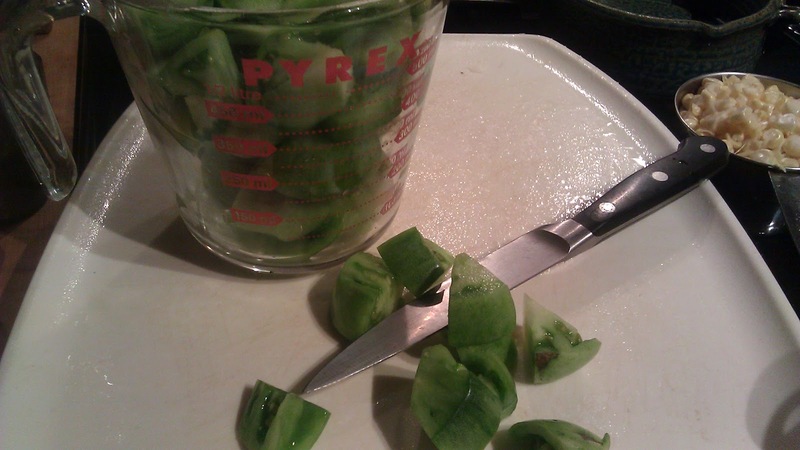 I have quite a bit of green tomatoes from my CSA, I need to use them soon. My stew here is not as spicy as I would like, again it has been adjusted for Mr. Wonderful. 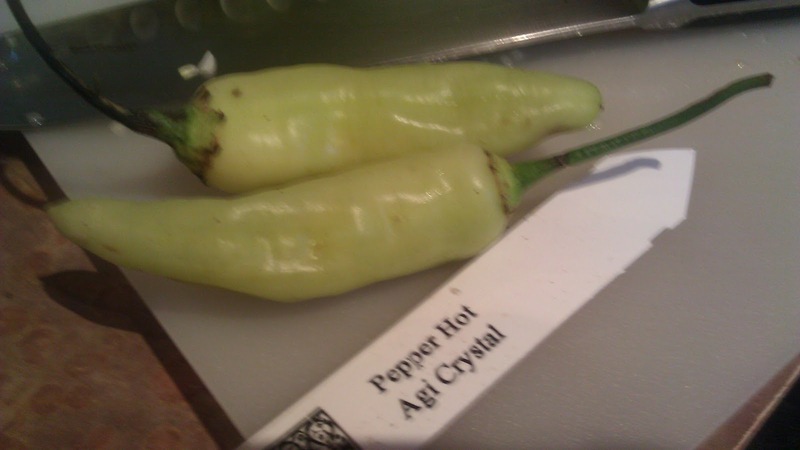 I used one 1 yellow agi crystal hot pepper, it has a sweet undertone and I also removed all the vein and seeds. 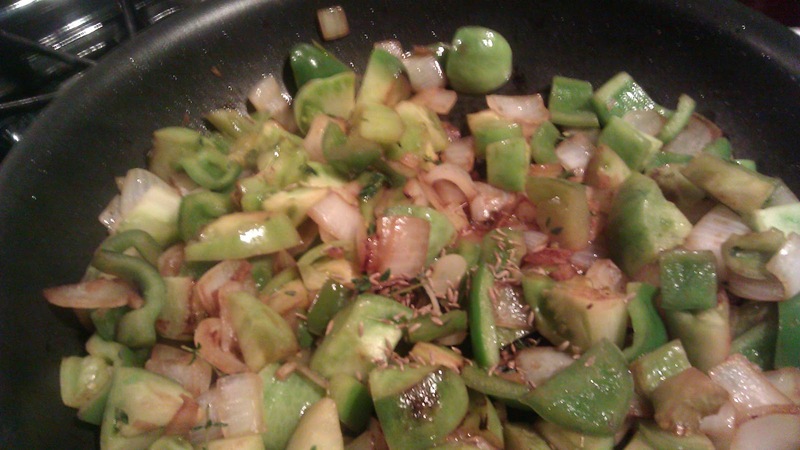 If you like heat, you can leave the seeds in or follow the recipe and use 2 peppers instead. 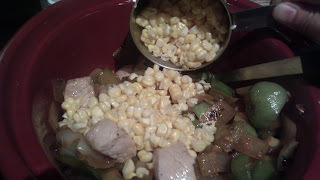 This is a very simple dish, great for weekday dinner, you can put this together at night and turn on the crock-pot when you leave for work. With some of the newer crock pot, you can program to cook for certain amount time and it will turn over to "keep warm" when it is done. Dinner is ready when you get home. 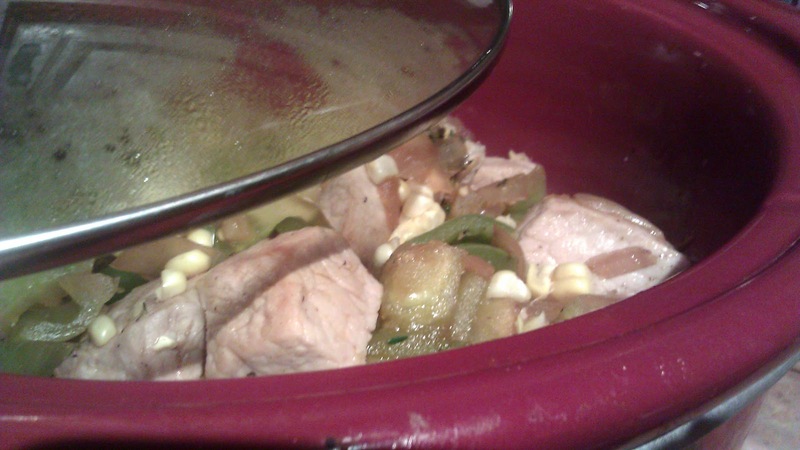 I am cooking this overnight in my "ole faithful" crock pot. It does not have a timer, I put it in low and I will be smelling the stew the whole night. 2 small hot pepper. Seeds and veins removed. 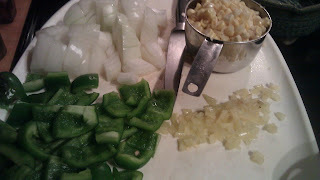 Finely chopped. I am using an Aji crystal pepper. 1 cup cut sweet corn. 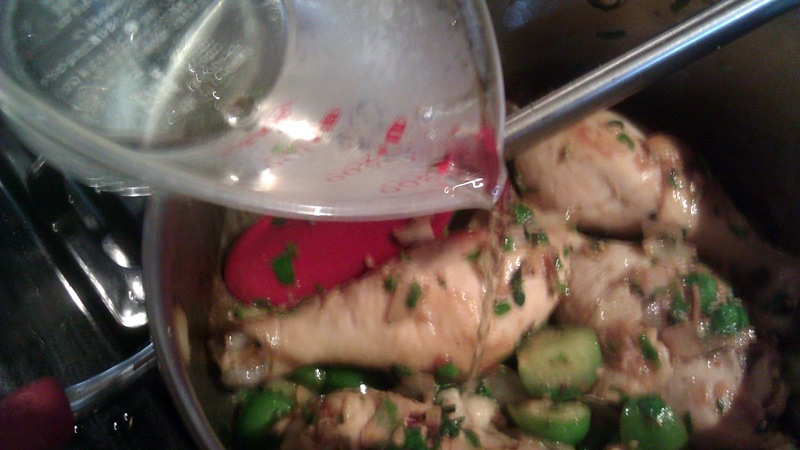 In a large fry pan, heat a couple tbsp olive oil. Add pork, season with salt and pepper. Add onion, bell pepper and hot pepper, cook for 3-4 mins till the onion softened. Add the tomatoes, let it cook for 5 mins. 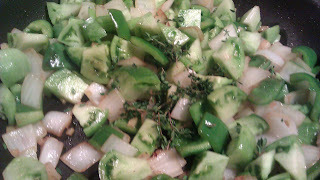 Cook over med low heat for about 5 mins till the vegetable a all caramelized. 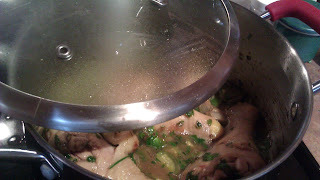 Add the stock and bring the vegetable mix to boil. 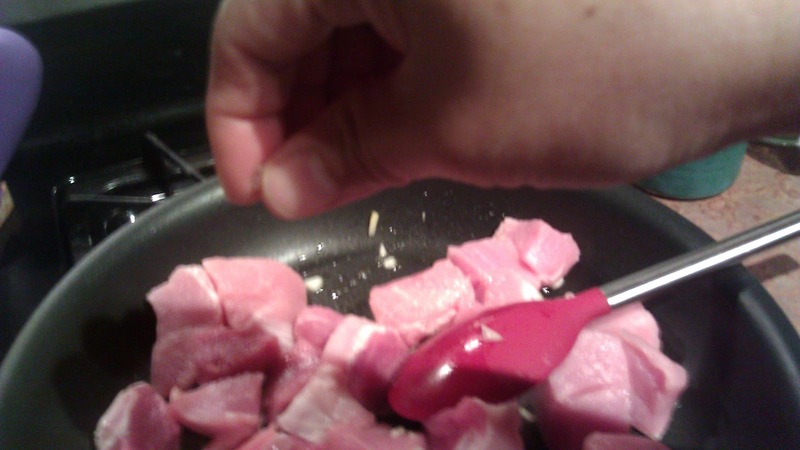 Check seasoning. 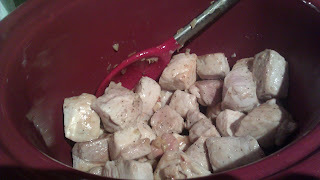 Spoon the mixture over the meat in the crock pot. Stir well and mix in the cup of corn. Cover, and cook over high for 4.5 hours or low for 6 hours. Great to serve with hot biscuits!